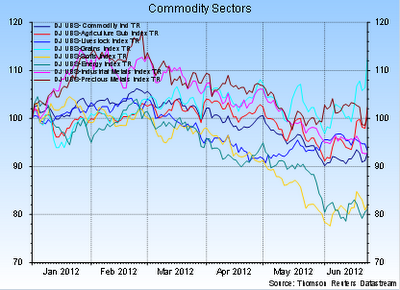 There is a decline in commodities for 2012 which is driven by the decline in economic growth, but the last month has seen a growing divergence in sectors. Grain markets are positive for the year but softs and energies have continued to stay at low levels. The weather effects have overridden any macro effects. The impact of the business cycle is strong over the last year. The peak in performance was hit in April of 2011. There was a slight increases during the first quarter of the year after strong economic information and the belief that central banks would provide more liquidity. 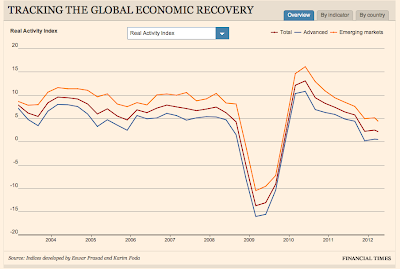 As economic data again turned lower there was a return to the trend decline. 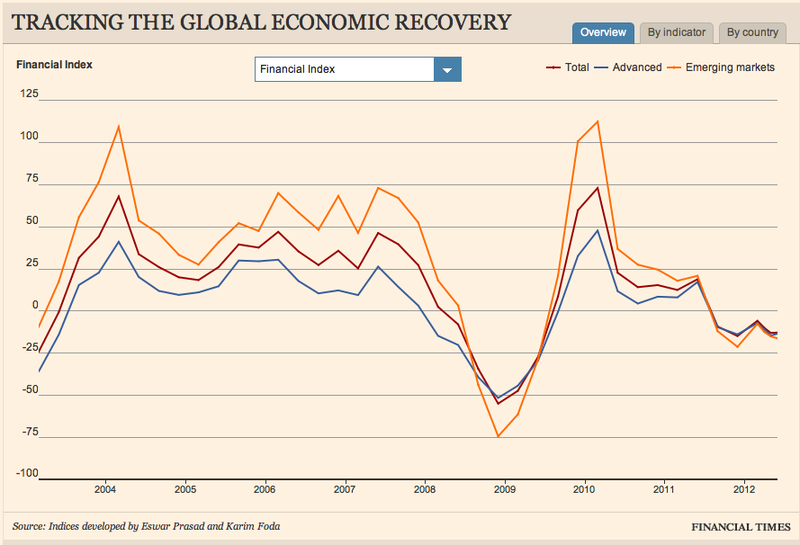 Three year charts show the recovery in the economy and the subsequent reversal. 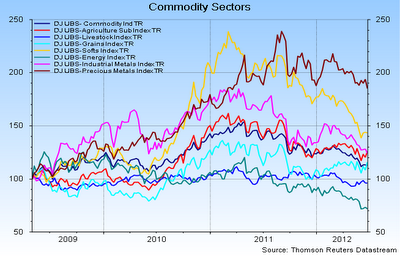 The recession bottomed in the summer of 2009, but commodities have shown mixed performance. Energy markets have declined with the fall in natural gas. Livestock has moved sideways during this period. Softs have moved away from highs with the higher cotton and sugar harvests. The only markets which have maintained higher levels is precious metals. 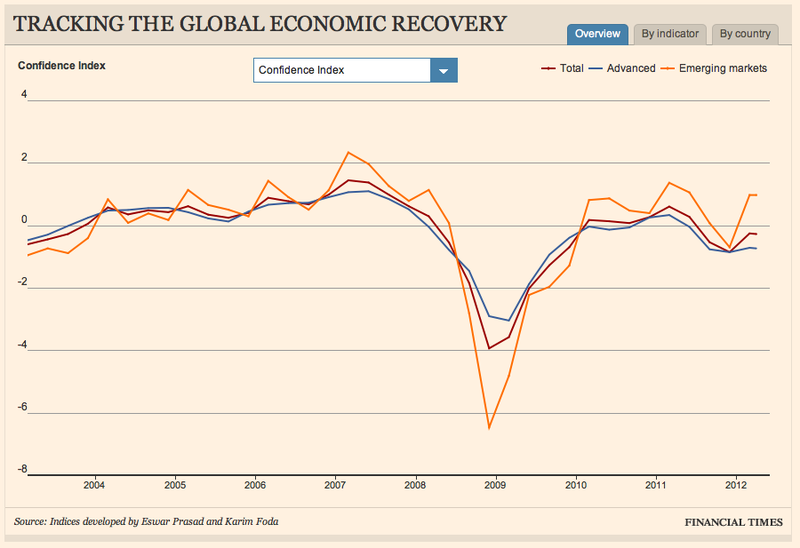 The FT/Brookings TIGER indices do not show a rosy picture around the globe. The overall index peaked in 2010 and has moved to negative territory for advanced economies and is about to turn negative for the developed markets. While there was a slight uptick at the first of the year, the numbers still look unappealing. 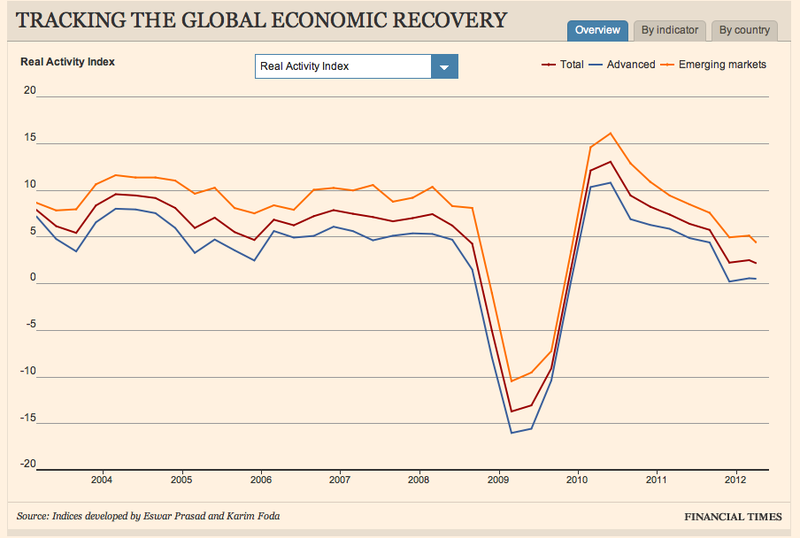 The real activity indices are moving closer to zero. The financial index has already moved negative before 2012 in spite of support from monetary authorities. 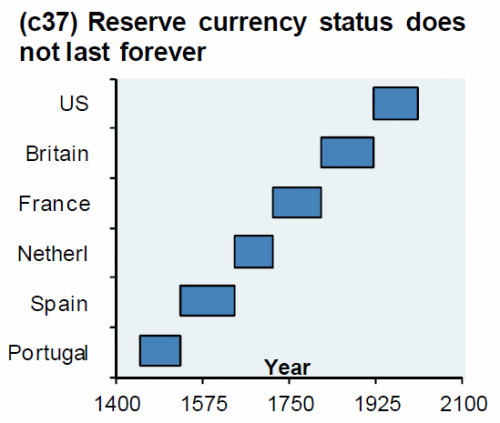 This chart from JP Morgan shows the dominance of a given reserve currency through history. 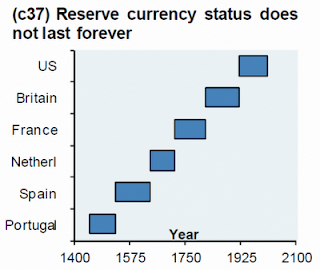 No reserve currency lasts forever. Power, politics, and finance shift through time. Right now, the dollar will not be supplanted by the Euro anytime soon. The decline of the dollar was often a key point of discussion even a year ago, but those discussions are now dead. This can change again, but right now the dollar is still the currency of choice for investors and central banks. Money has been flowing away from what was thought of as the next best alternative. The credit risk gap between developed and emerging markets is closing and it may be hard to distinguish between the two. In fact, there is a strong argument that emerging markets are being penalized by ratings agencies. A review of some simple examples makes the point. Using Spain and Italy as samples of developed market credit risks are extremes but tells the story of change. 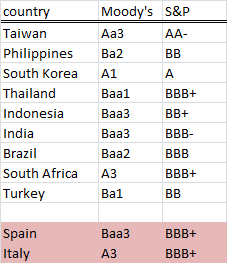 Taiwan and South Korea are in much better credit shape than Spain and Italy. The rest of Asia are all in stronger positions. Even risky South Africa may show a better fiscal balance sheet. So what is an emerging market? 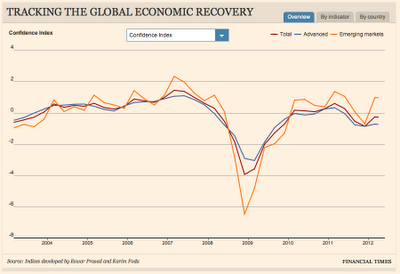 There has been significant talk about uncertainty driving the poor recovery. There has been more work in trying to measure this uncertainty which is very useful. However, the type of uncertainty may have more to do with future policy choices. Another variation on this uncertainty theme is that there just is policy paralysis given there are no new ideas on how to solve the crises being faced. It is well known that the current slow growth is a direct result of a financial credit crisis and not the normal inventory overhang often seen in business cycles. A financial crisis just takes longer to work-out and is not subject to the same responsiveness to policy. For some this requires a purging of bad debt. There is agreement that this has to occur but the problem is determining who will feel the pain of the purge. This creates policy paralysis because there is not a clear solution. Policy paralysis also leads to political brinkmanship. Each party wants to hold onto existing ideas and not change. They hold onto existing ideas because there is not a new solution that has been presented by either party. We have traditional Keynesian policies on the one hand and variations on classic economics of purging bad debt on the other. There has to be a new solution. Unfortunately, reviewing the economic literature, I am hard pressed to find any solutions. Consequently, there is a continuation of the same and no movement. This leads us to the fiscal cliff. The existing debt plan cannot last forever, so politicians are willing to take the economy to the fiscal cliff in order to avoid any hard choices with policies that are viewed as suspect. The fiscal cliff will require compromise and action, but we are not there yet. Market will move sideways until we move closer to the fiscal cliff. We will see some movement in the EU given the recent elections, but the real test of the fiscal cliff will come after the US election. While we wait do not expect much market activity. Russell Sage, who when asked how he founded his fortune, replied: "By buying straw hats in January." Great quote but the hard work is finding straw hats and knowing it is January. If you follow this strategy you cannot expect to make money in the short-run. The issue is whether you have the time tolerance to wait for the next season. I have been spending more time thinking about crowded trade. The trade may be the right one to place but being crowded creates a different level of risk than with other trades. Crowded trades also mean that there is less thinking about what may go wrong. When this happens, there is a greater likelihood that when the crowd changes, there will a significant adjustment in the market. Crowded trades are also difficult because they are more likely to be adjusted when there is a switch between risk-on and risk-off environments. When there is more risk placed with a certain type of trade, there is also more likelihood that the risk capital will be reversed at critical times. Still, the most important issue is determining what is a crowded traded. These are the trades that become popular. There is nothing wrong with being popular except when it becomes "too popular" and this is the issue that is hard to measure. Crowded or popular trades are like momentum. Anyone would like to be in momentum trades but need to determine when to get out. A measure of polarity would be nice but i leave that for more work. A good friend referred, The Art of Contrary Thinking by Humphrey B Neill, as a must read for my investment library. I first viewed the basic idea of contrary thinking as being somewhat easy to grasp. Figure out what the market is doing and take the opposite side. Of course, this is an over-simplification, but it provides the idea of what most people think when they hear about contrary thinking. The book actually should be called the art of critical thinking. The author argues that to be contrarian means to question the basis for standard or conventional wisdom. Here are some quotes from the book which should provide a flavor of the work. "Thrust your thoughts out of the rut." In a word, be a nonconformist when using your mind. Eliminate sameness in thinking or has often been said, "when everyone thinks alike, everyone is likely to be wrong." Think with your head as an individual and not with your heart like the crowd. "The art of contrary thinking in training your mind to ruminate in directions opposite to general public opinions; but weigh your conclusions in the light of current events and current manifestations of human behavior"
"Contest the popular view." It is a way of thinking .. it is a thinking tool not a crystal ball." "If you don't think things through, you're through thinking." "The crowd has always been found to be wrong when counted most to be right." The general opinion is the prevailing thesis. The contrary or skeptical analysis (the antithesis), and the conclusion you arrive at is the synthesis of the common and opposing viewpoints. The prevailing thinking is more of the same. The contrary viewpoint entertains something better or worse than expected. Being a contrary thinker is hard work. Most are not ready for this type of analysis, but The Art of Contrary Thinking will help to get anyone started on a more critical path. Fed extends Operation Twist until the end of the year with swap potential of $267 billion to buy 6-30 year bonds in exchange for 3-years and under maturities. The Fed wants to continue to flatten the curve in a low growth economy.The Fed also said that it would be will to take more action as appropriate. The first Operation Twists began last September 21 and totaled just under $400 billion. It was supposed to end this month. It was able to lower 10-year yields about 25 bps. The stock market gained about 18% since the program began but growth has stalled to a rate below 2%. The flattening of the yield curve will provide added value to banks and long-term borrowers including home-owners. However, the economy seems to be more effected by cash flow expectations than the discount rate. The was a simple policy adjustment that moves closer to more QE without announcing another QE program. I saw this in Brad DeLong's blog. It is what we hope for as we enter the last few months before the election. Call it by any name, but the BOE is inching to more QE stimulus. However, Great Britian may have to wait a little longer. The MPC voted 5-4 not to increase QE by 50 billion sterling and voted against Mervyn King. It is unusual that the MPC would vote against Governor King. It shows that there is not a consensus on what can be done to jump-start the economy. The new Extended Collateral Term Repo program is being employed but there is a growing view that another QE round is necessary. However, there may have to be new tricks in the monetary bag because quantitative easing has generally become less effective as it has been more actively employed. . Very interesting piece from the Atlanta Fed on their blog, called The Armchair Fed historian. The author, Will Roberds, uses the Ngrams google application to look at the number of references to different monetary policy concepts. An important question has been the shift in focus between rational expectations which suggests that the impact of monetary policy is limited versus the more activist views of John Taylor. The Ngram will pick-up the numbeer of references through Google books and suggest which has become more important. You could consider this the meme underlying monetary policy. He looks at the reference to the Lucas critique of rational expectations versus the Taylor for controlling monetary policy. The Ngram shows that there was a significant shift from the rational expectations view to the Taylor rule. Similarly, Roberds analyzed the Fed's priorities or goals for monetary policy. There has been a clear shift from price stability to financial stability. The Phillips played an important role in the early 1980's but now has fallen in importance. Financial stability is now more important than price stability and unemployment. This is a major shift in behavior; however, it can also be thought of as a return to what was previously important to the Fed. There has been reported a shift in the rhetoric by some Fed officials that there needs to be more stimulus based on the uncertainty that is present in the economy. The added stimulus would be a form of insurance against downside growth risk. This is a policy that was stated by Greenspan and may have been one of the cornerstones of the Greenspan put strategy so often mentioned during the rein of Greenspan. The alternative policy is the "leave some dry powder" policy which would be to hold off with anymore stimulus until it is absolutely necessary. This choice between activist intervention before a problem hits versus waiting on policy action may be one of the key drivers in investor expectations over the next few months. The cost of picking the wrong commodity index is significant and means that extra care must be taken when investing in any commodity product. 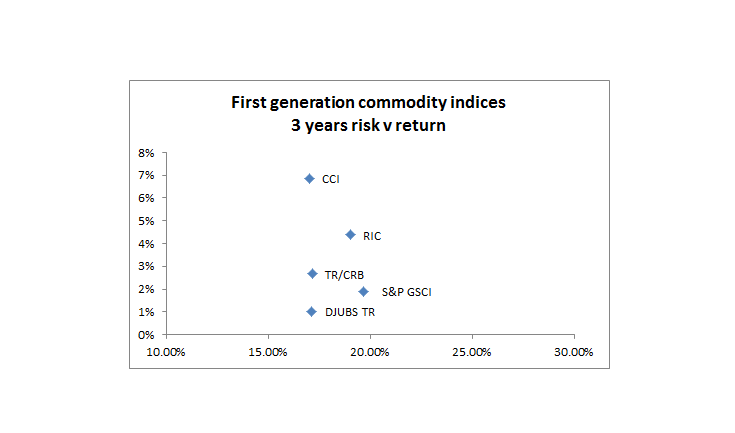 The charts above show the annual return and volatility for some of the major commodity indices over the last three and five years. 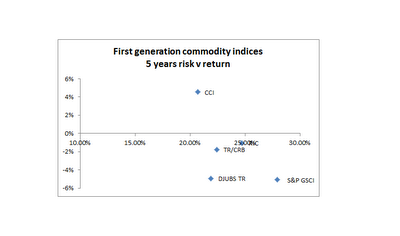 Note the wide dispersion in in returns and risk. The return differential over five years is over 950 bps while the risk difference is about 725 bps. Over a three year period, the difference in return is slightly above 575 bps. The volatility difference is much lower at only 250 bps. The differential in information ratio from these differences in return and risk are also significant. The range over 5-years is between .22 and -.23. For three years, the range is between .40 and .06 over a three year period. There is no such thing as saying you will just invest in the commodity benchmark. In equities, the S&P 500 is the dominant benchmark, bu tin commodities there has been switching between the S&P 500 and DJUBS. If we look at just those two indices, the return difference over 20 years is 182 bps; for 5-years 14 bps; and for three years 88 bps. For volatility, the difference for 20, 5, and 3-years is respectively 620 bps, 600 bps, and 250 bps. This is clearly much tighter than the CRB, Rogers or Equal weighted indices. Currency strength is not a positive for the Swiss franc as the government continues to try and force the currency lower. Intervention has been in 2012 and there was a sell-off in May, but the CHF has again tried to move higher. The SNB has set a ceiling against the Euro of 1.2 CHF, but with a reprieve in the Greek crisis, there may be more room for a decline. The Euro is off its 22 month low but it is not clear that the fundamentals will allow for any sustained increase in value. Right now, the SNB would like a less safe currency. Forget Facebook, there has been a shortage of IPO's in 2012. There have been only 224 announced this year versus 308 last year for a decline of 27%. There have been 57 withdrawn or postponed versus 43 last year. The amount issued is up 4% to $31 billion but if the largest Facebook deal is dropped, the numbers are very unattractive. Talk is growing that there is a "de-equitization" happening in both the US and Europe. There has been a decline in equity allocations across pension funds in the US. Bond mutual fund flows have continued to increase relative to equity flows. For example, in the last month, bond fund saw an increase of close to $18 billion while equity funds lost $11 billion. Investors want safety regardless of yield. This flow will create the next investment problem as investors over-extend into bonds. The UK government may change the measure of inflation which will have a significant effect on the inflation linker market which is currently 338 billion sterling. This is a special risk not found in commodity markets which is governments may change the rules of the game. The change in inflation measurement will reduce the liabilities of the government but at the expense of those who have bought inflation products. Some now say that this could have a 40% impact on the value of linkers. There are two major inflation indices in the UK. The RPI (retail price index) which is calculated by using an arithmetic mean and the CPI (consumer price index) which uses a geometric mean. The CPI allows for the substitution of cheaper goods and will be lower than the RPI. The difference now is 50 bp (3.5% versus 3.0%). There is a UK government committee proposal that will switch the RPI calculation so that it is closer to the CPI. There are "Materially detrimental" clause in the RPI linkers, but there may be a disagreement between Treasury and the BOE on what it means to have a material change in the bonds. The cost is high for these products. Yields are currently negative in the UK. The question is whether futures can serve as a better alternative for inflation protection. 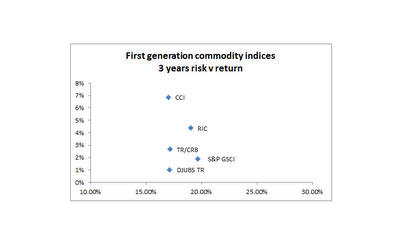 You get liquidity with futures, but you do have basis risk between the commodity behavior and the inflation index. Commodities as an alternative inflation protection improves if there are going to be changes in the construction of inflation indices which effect swap and bondholders. The Treasury and the Bank of England will try and jump-start the British economy through coordinated action to cut costs for banks and boost lending. The BOE is moving from a focus on money creation to a focus on credit expansion. This shift in emphasis is part of the larger research shift from money to credit intermediation as the key to central bank activity. The Chancellor of the Exchequer, George Osborne, stated that there will be more for monetary policy to do to help the economy. The BOE will activate sterling liquidity facility. The BOE will be the advanced guard of innovative monetary policy in other countries. We expect that the Fed, ECB, and BOJ will all follow the same strategy as the Bank of England. The timing may be difficult, but it sis still likely that this move to further credit expansion will be necessary to offset fiscal austerity. The term BRICs has been around for over a decade and has been the poster child of emerging market resurgence; however, it is not clear that BRICs will be the solution to the global growth problem. The BRIC story has changed for the worse. China is now seeing growth that is closer to &.5Z% and not the double digits from the last few years. 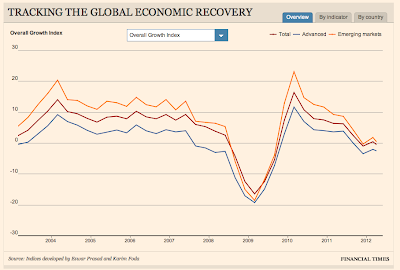 Brazil is tracking with a growth rate that is closer to 3%. Industrial production has actually turned negative this year and showed a -2.9% yoy for April. Russia is negatively affected by the falling oil prices. It is falling into the same behavior as other commodity driven export economies. It growth rate last year was 4.3%, but the latest industrial production is at 3.7% yoy for May. These are not bad numbers, but they are not the numbers associated with special emerging market economies. One of the more interesting research papers to come out recently has been "Credit Booms Gone Bust: Monetary Policy, Leverage Cycle, and Financial Crises 1870-2008" by Moritz Schularick and Alan Taylor. It can be found in the April 2012 American Economic Review. The paper tries to place the relationship between money and credit in context over the long-term. This is a good extension of the book by Reinhart and Rogoff. This Time is Different. Reinhart and Rogoff talk about debt crises, but most of these crises are associated excessive credti expansion. If there is no credti expansion, there will not be a debt crisis later. The main objective of the Schularick and Taylor paper is to try and determine the link between money, credit and output over the long-run across a broad number of countries. But looking at this link between credti expaniosn in the long-run is a problem of any infrequent events. There is just not that much information. This then plays out with financial crisese which are also rare events within a credit cycle. Hence, there has to be more work digging through the past to find the data necessary to make some generalizations. Schularick and Taylor, through their analysis, are able to form a view that there have been "two eras of financial capitalism". The first era runs from 1870 until 1939. The second encompasses the post-WWII period. In the first era the relationship between money and credit was volatile but showed a stable relationship which also carried over to GDP. The would can be characterized by the "money view" which is consistent with the classic monetarist view of the link between money and output. This was the period studied by Friedman and Schawrtz in their classic A Monetary History of the United States. Monetarism is a function of the stable money relationship. The second era or second period could be called "the ascension of credit". The link between money and credit broke down or more importantly, the amount of credit associated with any quantity of money increased. Credit was decoupled from money through the increased use of leverage and the development of financial intermediation outside of the banking system. This would also be the period when there was the development of the "credit view" toward banking whereby the impact of the credit transmission mechanism was independently important relative to the creation of money. Between these two periods was the development of the "irrelevance view" toward banking where real economic decisions were independent of financial structure. This view, developed by Modigliani and Miller is consistent with ideas developed for corporate finance. This view was extreme with respect to money in that money would have nominal but nor real effects on an economy. The view of the world that actually fits the facts is extremely important for policy makers and investors. The inflation target, monetarists, Taylor Rule, and Rational expectations would all to some degree come to the conclusion that credit transmission is not that important for central bankers. Of course, regulation of banks is necessary and tracking of credit is relevant, but it not something that should be explicitly controlled by central bankers. This would be the dominate school in the pre-2008 period. In reality, the transmission of credit is critical to economic growth. Under this view, central bankers have to spend time and effort on understanding the credit process. More credit innovation lead to the growth of credit outside of money. More financial innovation further destroyed to close link between money and credit. The authors looked at financial crises in the two periods and found that the impact of credit crises had strong real effects during both periods. We have not been able to stop crises and their impact is real given the stronger role that credit plays in the economy. Lagging credit is a good predictor of financial crises. We live is a Minsky world. Regulators and central bankers have to accept this new world view and focus on credit expansion and not just money growth. “Jiangxi Copper halts export program after one month” Chinese smelters export copper in response to domestic glut. China had been stockpiling copper when growth rates were double digits. Now that growth rates are more modest at 8 percent and there is a change in the mix of spending, smelters are sitting on too much copper. So what makes sense? Sell it on the world market outside of China. Unfortunately with China representing 40% of global demand, the impact is as expected. Prices started to fall and the remaining inventory is now worth less. You cannot just avoid price declines in a market with shrinking demand. The laws of economics do work. The inventory has to be held by someone and a change in ownership will have to be at the current price. This a a good twist of the phrase and may be the best short explanation of the current state of large banking. Any firm should be transparent enough to be easily explained and managed. The current set of large banks cannot be managed. Managers cannot explain simply their business model. We can see that with JP Morgan and they are too big to fail. There is systemic risk and regulators may not be able to manage that risk. If this is true, then the roll of government should be to break-up banks and make them follow a size and function that can be managed effective;y, regulated simply, and diversified appropriately. Does it really matter if the dollar is the lesser evil or a fortress of safety. Yes, the reasoning is different and tells a very different story about the US and global economy. The dollar is a safety fortress during most crises. It is still the place of safety around the world because places like Switzerland are too small and Japan does not have the developed financial system to serve as a reserve currency for safety. Both are creditor countries and will see gains when there is a safety crisis, but the dollar is still the fortress of choice. The Fed has also stabilized the growth of money relative to other large G7 currencies. This provides currency protection. The dollar is also the lesser evil because the fiscal problems of Europe are also present in the US. The risks are still a few years off but present. Fiscal risks can increase in the next year if there is another recession. 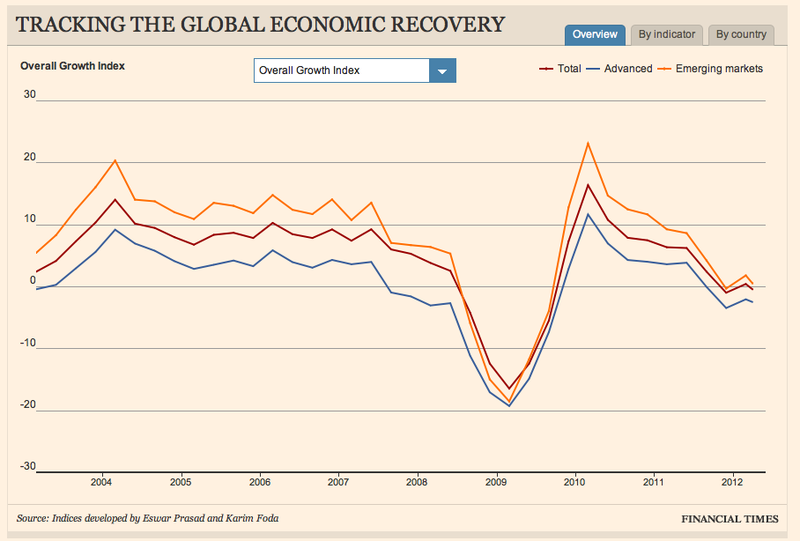 While slow, the US growth rate still looks better than most G7 countries. By a matter of degree, we can think of the dollar as the lesser evil. A currency is always a relative price. There is a current theme running from central bankers to the fiscal authorities. We cannot solve your problems. We will not solve your problems. This places the market in a dangerous situation. The fiscal authorities have to do something to get monetary cooperation, but what central bankers want is austerity and that is not what governments want to give. It also may not be the right policy. There is not much that central banks can do with rates down close to zero. They cannot monetize Treasury assets and they do not want to buy risky assets except as a last resort. The policy of raising inflation targets is not being discussed in polite company, but is the choice that may be most helpful to the fiscal authorities. In the world of more central bank transparency, how should the markets interpret this message? It is not clear and makes for more policy uncertainty. it does not help if you do not specify what action should be taken and what are the conditions for action. The market needs and wants an old fashioned speculative bubble, We are not talking about a commodity bubble which will always be viewed speculative excess. The market and policy-makers want a good old “castles in the sky” excess stock market that will give investors false hope. We are not getting one now. The bubble may be the excessive low rates but that may be more a function of the reality that growth is going to be slow coupled with central bank manipulation. We need a bubble where prices are above fair value. A housing bubble would be nice too. We want the perception that wealth is higher in order to fuel spending. The government has not fueled a new housing bubble and it could sure use one. The constraint on housing foreclosures is not enough. Some may say that college loans are a bubble, but unfortunately the loans have to paid back. The college loan issue is more based on the idea that you can avoid the bad job market with money that may not be paid back. It could fuel a bubble for the education industry, but that is another issue. Government want false expectations of over confidence in economies in order to sustain tax revenues and fiscal excess a little longer. It is not likely to happen, but that is what everyone wants. Does the market care about creditability? It is hard to find who wants central banks to be inflation fighters. Hence, there is no single group that really wants inflation creditability. This is hard to believe but seems to be the correct read of the environment. The lenders of money believe that they can adapt to a higher but not excessive inflation. Borrowers want the debt forgiven from inflation, government believe inflation would be good, and everyone wants growth. Central banks are not rewarded for their creditability except in the extreme. The creditability of central bankers is only a concern to themselves and to academics at this time. Still, there is still not a critical mass of dovish central bankers at the Fed. The low rate policy is a one of transparency and semi-dovishness. The inflation target is still at 2%. When there is more talk of a 4% target, we will have moved to the creditability tipping point. Look for more talk of higher inflation targets in the next quarter if we do not see growth. Should we become like Japan? Given the consistent talk about the “Lost Decade” in Japan, it is interesting that Krugman would think that this would be a good path for comparison. While the stock market has never reached its old highs, growth in Japan has been steady. Growth has been high volatility and the strong engine of the past does not exist, but growth has been above 2%. Japan avoided some of the excesses prior to 2008 and has weathered the post-crisis period better, but this does not mean that this is a success story. Japan has not been a model of good Keynesian policy or consistent monetary policy. It is hard to say that Japan should serve as a model of what the US should do. First quarter GDP was 4.7% but the prior quarter was .1% Japan has been much more volatile with growth than what has been seen in the US. Unemployment is rising. The rate of unemployment is below 2009 highs but still at 4.6%. With a Spanish bank bail-out likely costing more than a $125 billion, the death spiral continues. There will be a point when the money is not available for the next bail-out. The Fed could be an important player in the European story since there will not be any help from the US government. The Fed could provide dollar swaps to banks in order to add liquidity to the overall system. This would be similar to the swap lines offered in the last year when money was flowing back to Europe. There is some truth to the comments comments that Europe may drive the US election, so help in the form of monetary support to the EU is likely as a derivative of looser monetary policy in the US. China monetary easing - more important than the Fed? There is the thought that this is important news. It is but not because the PBOC will lead to a global recovery. China lowered one year lending rate by 25 bps to 6.31 percent. This was the first cut since 2008. There was also a loosening of controls on bank lending and deposit rates. The one-year deposit rates move down to 3.25 percent. There will be more flexibility around those rates. Banks can offer a 20% discount from the lending rate as opposed to the previous level of 10%. Deposit rates can move up to 10% higher than the posted rate. Banks are tightly controlled by the government. There is no independent banking system for large sized lending. Most lending is controlled by the Big 4 banks. There is not an independent bond market. Cutting rates and allowing higher deposit competition states that the lending targets are not being hit and more deposits have to gained in order to improved the borrowing base. There is a problem with the loan portfolios for many of these institutions steps have to be taken to improve banking in a slower growth environment. An interesting book on banking in China is Red Capitalism: The Fragile Foundation of China's Extraordinary Rise by Carl Walter and Fraser Howie. Walter and Howie argue that there is no western style banking system in China. The face of banking may seem like Western institutions but it almost completely controlled by the state. The state controls the lending process and the state enterprises are often the borrowers. The SOE's may not pay back their loans and banks have to cover the loses and the problems. Nothing changes with a lowering of rates. There may be some adjustments but banks needs the stored to ensure their survival. This lowering of rates is not a positive sign but an indication that there are further problems in Chinese financial markets. The current so-called commodity super-cycle started in 2002 and is a decade old. 2012 is starting to feel as though there is less “super” and more “cycle” in this commodity move. A drawdown and more sensitivity to global macro growth makes the focus on microeconomic effects and macroeconomic factors and less on long-term price themes more relevant. 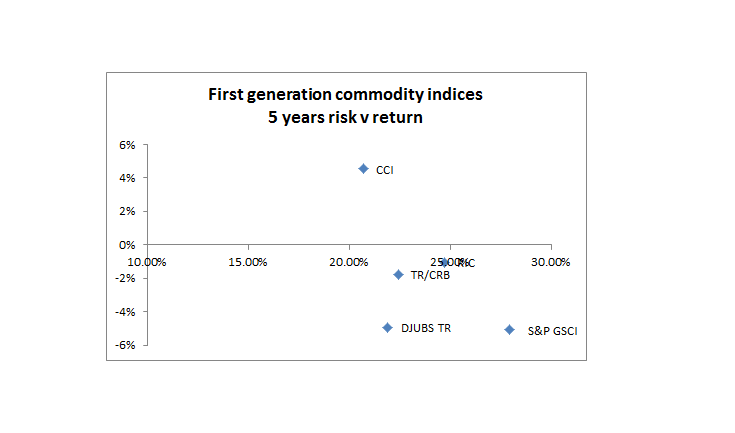 There are some clear factors which affect whether there will be a long cycle in commodities and they still have potential for causing a further run-up in commodities, but their potential impact on current return generation has to be tempered. The DJUBS index declined in May by 9.13 percent, the second worse month outside of the July through October 2008 market debacle in the last ten years for an YTD loss of 8.74 percent. 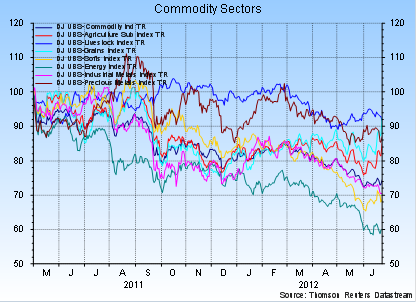 The commodity index is in a drawdown of 26.78 percent since the end of April 2011. The DJUBS Agricultural index saw a decline of 9.90 percent and is down 7.37 percent for 2012. Its drawdown is 23.93 percent since the end of August. The bearish bias for May was extreme. All major energy markets were down double digits except for natural gas which was affected by North American weather. Both base and precious metals showed declines. Agriculture markets were down except for soybeans and meal, feeder cattle, and hogs. Continuation of any cycle across all commodities is by definition a common macro-factor across markets and that key macro-factor is still money. Alternatively, policies which inhibit trade and growth can turn this super-cycle into a period of prolong decline. Behind this backdrop are localized market factors which are still the most important determinants driving markets. We have mixed views on the concept of a commodity super cycle. There has been a strong cycle that has reasonable economic foundation. It was interrupted with the 2008 financial crisis. The general commodity market has improved, yet levels for many markets are still below the highs of 2008 and is in another drawdown. Large cycles in commodities exist. However, the measurement of any so called super or long cycle is hard to measure because there have been so few. There is no clear basis for saying what should be the length of any commodity cycle whether super or not. While there have been super cycles which have lasted for more than a dozen years, it is clear that we are at the longer-end of any cycle. The rationale for any strong cycle is clearly associated with the overall global business cycle as well as the production and investment cycles within commodity markets. There is a long lead time between the production of commodities and the infrastructure development to generate production. The production development time for agriculture may be as short as one or two years. For oil and metals, production development may take several years. Given these development times, there will be a natural cycle that may not be as responsive as other production processes. Any super cycle has to be driven not just by production and supply constraints but also by a shift in demand. We have had a structural shift through the growing middle class in emerging markets as well as overall GDP growth in developing countries. There has been an extended period without an emerging market crisis as well as an extended period of stable growth with controlled inflation. Government have embraced market-based growth strategies that have raised income levels. 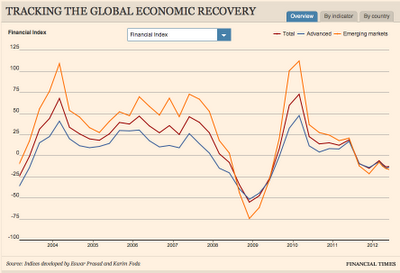 Trade has blossomed over last decade even with the financial crisis. The explosive growth in the BRIC countries has been the most discussed theme on emerging market developments. The longer-term demand side from emerging markets as a driver in this super-cycle is real, but it is still subject to changes in the global business cycle and changes in consumer tastes and demand. For example, China is moving from a phase of infrastructure capital to consumer development. The current decline in commodities matches the slowdown in global growth over the last year. The commodity slowdown also correlates with the reduction in emerging market stock prices. Given this correlation with emerging market equities, the commodity markets are behaving like other asset markets tied with growth cycles. The length of this long cycle is related to the structural changes in emerging markets. Commodity demand growth will increase with longer-term world income levels and enhanced global trade. A simple depiction of this relationship is looking at world trade year-over-year changes against the year-over-year changes in the DJUBS total return index. While the correlation is not be perfect, world trade growth as a proxy for structural change in global markets matches with commodity gains and loses. The slowdown in global trade has coincided with the decline in commodity prices. The seeds of destruction for any super-cycle are sewn through price increases. 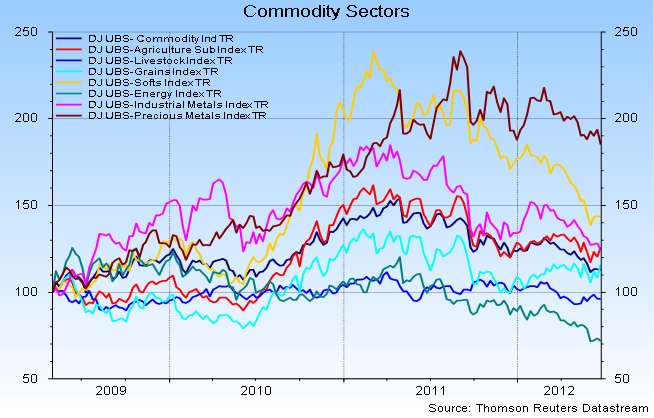 Commodities are inherently mean-reverting. As prices rise, there will be a natural rationing of demand. As prices fall, the demand for any commodity will rise. Similarly, there will be a greater response in supply as prices rise. Given the natural response of supply and demand, there will be long-term price reversals at cycle extremes. What is the cause of any super cycle? There is a structural constraint on demand or more importantly, there are structural reasons why income cannot grow to create demand. If there is a lifting of government constraints on demand, there will be a long-term increase in prices as markets move to equilibrium. On the supply side, change in government policies or structural changes will lead to price gains. If there was a period of underinvestment, the ability to produce is curtailed and prices will rise. Similarly, if there is a period of high real rates of interest, there will be less investment in commodity production. Extended periods of low (high) price levels will create more long-term demand (supply) which will see a general rise (fall) to fair value. Consumer and producer behavior adapts to prolong price levels. There is an increase in demand associated with inflation. A long-term cycle will occur if there is a long-term excessive money growth. Most super cycles have been associated with war and economic upheaval. These periods are also associated with inflation. Price cycles have been closely associated with wars. World War I, World War II, and Cold War have all been periods of cycle extremes. The breakdown during the Great Depression, the Industrial Revolution, the evolution of emerging markets and the WTO have all served as catalysts for commodity cycles. The current cycle is actually missing the more traditional global dislocation stories for price highs. Not that we need a war or higher inflation, or structural change that will lead to higher price, but this is the requirement for a much longer up cycle. There is no well-defined method for determining the beginning or end of a long commodity cycle. In fact, the dating process of any business cycle is not clear-cut and the peak of and troughs of business cycles is often subject to delays. In the US, the NBER business cycle committee determines dating and even though there is a set of variables, the process is not mechanistic. An analysis of commodity prices back to 1973 in the recent IMF World Economic Outlook suggests that the current cycle is very different when broken down by commodity sector. Agriculture and raw materials are still half the price level in real terms. Metals are flat and only energy has increased by over 150%. Many market commentaries and investors have focused on the concept of a commodity cycle as measured by the fluctuations in a commodity basket. The concept of a broad commodity cycle is somewhat suspect given the diversity of markets within any basket. Agricultural markets can move in opposite direction from energy or base metals. However, the financialization of commodity markets and the growing linkage between markets makes any cyclical amplitude more likely. The monetary growth story which will lead to commodity inflation is still one of the key rationales for a continuation of the super cycle. The money inflation link during this financial crisis has been tenuous, but most prior super cycles in commodities have been linked to excessive money creation. Speculation and manipulation - where is the evidence? And recall what Judge Easterbrook wrote over 25 years ago: an undetected manipulation is an unsuccessful manipulation. If there is such a vast and successful effort to manipulate prices, the evidence would be there for all to see. So where was the evidence that speculators were keeping the price of oil high? We know have crude oil prices down $28 for WTI. Gasoline is down to level seen at the end of the year, and heating oil is down 78 cents. Perhaps this has something to do with the economic slowdown.